Separate the 2 pieces of the plastic ornament. Use wire cutters to cut individual berries from the stems. 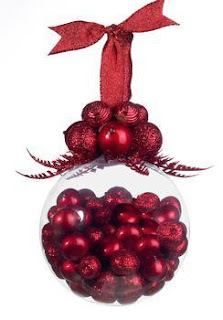 Fill the plastic ornament with the berries. Replace other half of ornament and snap securely to close. Hot glue a small cluster of berries around top of ornament. Fold the ribbon in half and put a knot on the end, as shown. Hot glue the ribbon in the center of the berry cluster. You may have to glue a few berries to cover where the ribbon was added. Hot glue leaves or extra pieces from the remaining picks under the cluster of berries to give it an added accent.